Ruth Badger, star of BBC’s The Apprentice, marked the official opening of a brand new development of luxury Bouja caravans in a ribbon cutting ceremony at Whitehill Country Park in Devon. 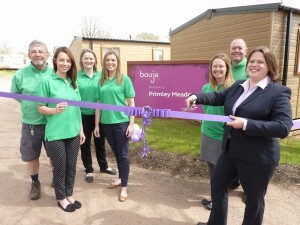 The former Sir Alan Sugar apprentice joined a host of other guests at the family-run holiday park in Paignton to celebrate the official opening of its Bouja range. Taking the holiday caravan experience to a whole new level, Whitehill is one of only six other parks in the UK to offer the brand new Bouja concept in partnership with Hoseasons. Described as ‘a new dawn in caravanning’, the boutique caravans feature added luxuries including iPod docking stations, WiFi and a Wii U, plus an outdoor hot tub.